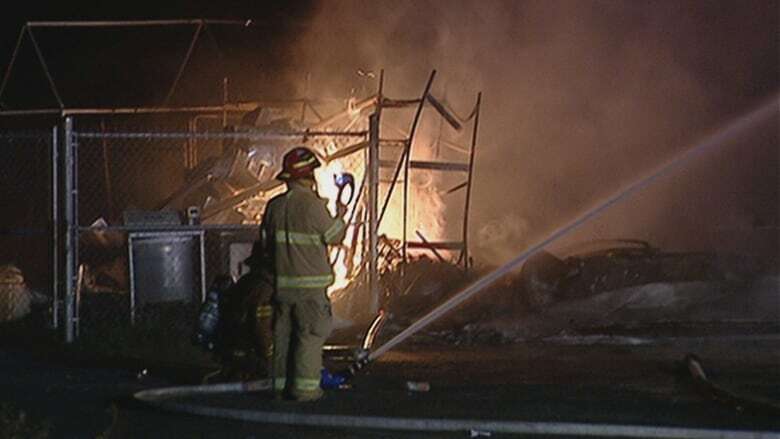 The SPCA of Western Quebec says over 70 animals died when its shelter in the Aylmer sector of Gatineau was destroyed by fire Monday night. Firefighters said they were able to rescue about a dozen dogs, but only six of them survived and are currently under the care of the SPCA de l'Outaouais, the animal welfare agency said in a news release Wednesday. "The staff and volunteers put their hearts and souls into this organization each and every day. Knowing that we were able to help find adoptive homes for so many animals brought joy to so many. To say that the last 30 hours have been difficult and devastating is an understatement. There are simply no words to describe our incredible loss and sadness," the release said. It did not specify what kinds of animals perished in the fire. Several passersby called 911 at about 10:30 p.m. Monday when they saw flames coming from the two-storey shelter at 659 rue Auguste Mondoux. When firefighters arrived they found flames engulfing the building's roof. The building began to collapse before firefighters could save any more animals, said Gary Barnes, the division chief of operations for the Gatineau Fire Service. "It is terrible, very terrible that we lost that amount of animals," Barnes said. "We did our best to save the ones that we could and also preserve the life of the firefighters." Damage is estimated at about $580,000. Hydro Québec confirmed there was a power outage in the neighbourhood around the time of the fire. The provincial energy utility is working with fire officials to investigate the cause of the fire. Animals killed by fire that destroyed SPCA in Gatineau, Que.